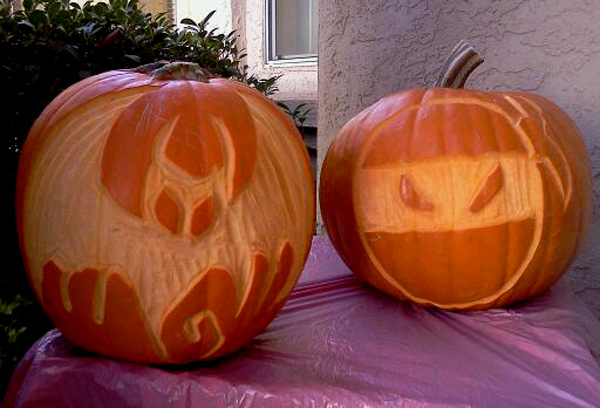 Happy Halloween to you and your family! This is one day of the year I feel sorry for all the school teachers out there, who have to put up with super excited kids the whole day. The other day I feel sorry for them is tomorrow, when the same kids will display their sugar crash and tiredness for going to bed too late tonight. 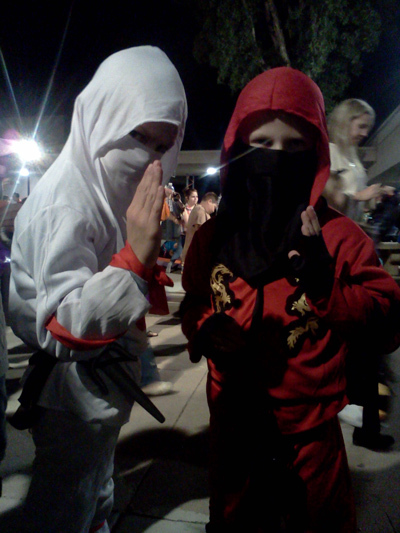 I’m taking two stealth ninjas trick-or-treating tonight. They’ll be heavily armed with plastic nunchucks and daggers (technically they might be Japanese sai, I’ll have to check with the experts). 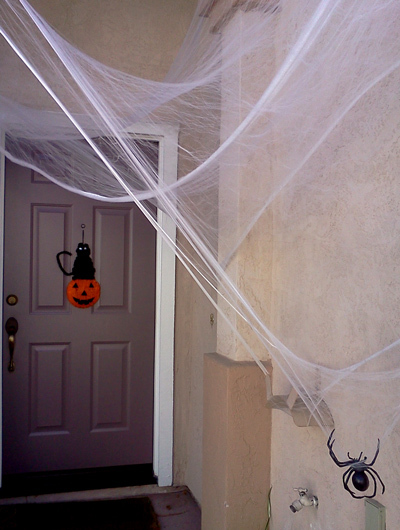 I feel sorry for those people who aren’t ready to hand out candy right when we ring their doorbell and bang on their door. Hi-yah! I took this picture at the school’s Halloween fair last week. Note to self: arrive at the Halloween fair much earlier next year, before all the good candy runs out. We’ll be leaving our Halloween candy bowl out and have kids help themselves to it since we won’t be out trick-or-treating ourselves. I leave a note asking them to take 2 or 3 things, and believe it or not, they really don’t take more. Thank you, parents, for making our candy bowl last! Our Halloween bowl is actually not just full of candy. 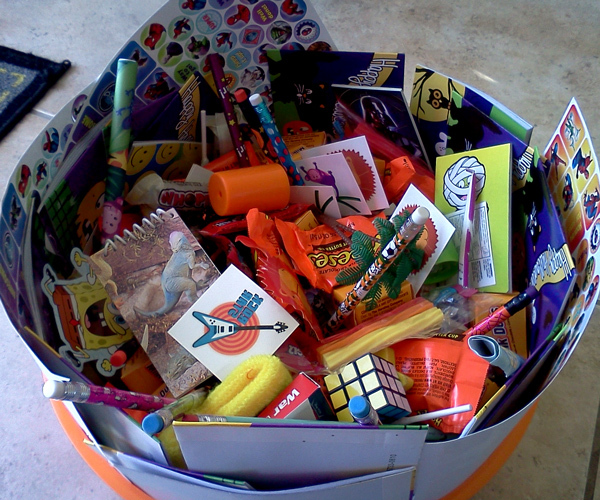 I gather all the leftover party favors, toys, games and other giveaways I buy throughout the year for birthday parties and school events, and I toss them in the Halloween bowl. Although many kids do expect candy for Halloween, they love to see they can also pick activity books, stickers, tattoos, and little games from our bowl. – How Children Succeed: Grit, Curiosity, and the Hidden Power of Character by Paul Tough. A fascinating read so far. It really throws a lot of preconceived ideas of what/how we should teach our children out of the window. – A Wind In The Door by Madeleine L’Engle. After enjoying A Wrinkle In Time so much, I thought I’d go ahead and read the other books in the series. You can read my review of A Wrinkle In Time here. Operation Family Secrets: How a Mobster’s Son and the FBI Brought Down Chicago’s Murderous Crime Family by Frank Calabrese, Jr. I probably wouldn’t have picked this book off the shelf out of my own curiosity but I had to read it for my book club. And in the end, I’m glad I read this book and this fascinating true story about the lives and deaths of Chicago mafia mobsters. It was interesting to learn how families got into the “business”, and how hard it was/is to get out. Reading about the many cold-blooded executions, the money schemes, the corruption, all of whom have inspired the famous movies we’ve all seen felt surreal. I just kept turning the pages thinking, wow, that stuff really happens in real life. I can’t imagine how much courage it took Calabrese Jr. to take down most of his family and associates, including his own father and uncle. The Seneca Scourge by Carrie Rubin (at The Write Transition). I have two words to describe this book: page turner. I usually don’t read medical thrillers, not because I don’t like them, but rather because I don’t know which ones I should read. The last one was Coma by Robin Cook, and even though it had its faults, it kept me on the edge. And that’s what The Seneca Scourge did too. I got sucked right in from the beginning and had a hard time putting the book down. I actually read the last 100 pages in one night because I wanted to know how it all ended before I went to sleep! I enjoyed the medical content, which was explained quite clearly, and the story twist was a great addition, giving the book a touch of sci-fi. Rubin describes the disease and its effects on people very well, and I command her for not including any gruesome details about dying children to try to make her book more sensational. I should add this book contains plenty of suspense, which definitely keeps you on the edge of your seat. I could totally picture this story turned into a movie, by the way. If you’re looking for a good medical thriller to add to your list, this is a good one. Defending Jacob by William Landay. An interesting story on a district attorney’s teenage son being accused of murder, but in my opinion, nothing more. This book is easy to read but could have used a lot of editing, especially as some of the dialogs go on and on. Maybe they can go on like that in court, but reading them gets tiresome. The same goes for dialogs between people. How many times can you ask the same question to your spouse or child in one conversation? I’m also not crazy how the author decided to tell the story: the father narrates today what happened in the past, hinting at things “he should have seen”. Well, duh, they’re pretty obvious to see as you read them. And really, the ending was no surprise. It wasn’t a shocking twist either. I guess if you’re a big fan of legal thrillers, you’ll like this book. Otherwise, it’s good, but not great. 1984 by George Orwell. I haven’t read this book for years and it will be nice to read it with a fresh perspective. Bats At The Library and Bats At The Beach by Brian Lies. We’ve read these books before and we loved the story and the illustrations so much, we wanted to read them again. Once darkness settles and the moon comes out, bats know how to entertain themselves, whether it’s by spending the night at the beach, making sandcastles, surfing, or roasting marshmallows and telling stories by the bonfire, or by flying to the library and enjoying a night of reading, storytelling and imaginary play. The rhythmic text and the enchanting paintings make these books pure magic. We’ve fans of Jonathan London’s Froggy books so we had to catch up and read his latest ones: Froggy Builds a Tree House and Froggy’s Worst Playdate. In Froggy’s Worst Playdate, Froggy’s friends are all busy and can’t play with him, so his mom decides to set up a playdate with… Frogilina, who really likes Froggy, but the feeling is not so mutual. Dad takes them to the movies and everything that could go wrong does, including a popcorn fight, bathroom breaks and a stolen kiss. Oh, and let’s not forget how Frogilina enjoys eating Froggy’s ice cream by crunching the bottom of his cone, making his ride home a “perfect” ending for his worst playdate! In Froggy Builds a Tree House, Froggy and his friends want to build a tree house (Froggy’s dad has to help out, a lot) but watch out, this house is for boys only! That makes Frogilina very upset but it doesn’t take long for her to save the day. Kate DiCamillo’s brilliant Bink & Gollie’s new series, which includes Bink & Gollie, Bink & Gollie: Two For One, and Bink & Gollie: Best Friends Forever. Even though these books feature two female characters, my boys enjoyed them very much. Gollie is tall and fashionable, and a little snobbish and bossy. Bink is much shorter, loves pancakes and is always looking for a new adventure. I love how the two characters balance each other. Bink tends to act as a reality check for Gollie, who in my opinion is not the greatest role model for friendship. The funny illustrations are a perfect match to the characters and the stories. Warning: this post contains gruesome images of wild animals in action. Let me take you down a different path for today’s edition of Goofy Monday. Rather than sharing the funny things my kids have said recently (and there are many), I thought I’d show you what’s been going on at our house instead. I have to admit, it took me a little while to catch on, so I’m not sure when this all started, and who started it. But once I noticed the various scenes of our own version of Animal Kingdom, I knew I had to document the event by taking pictures. 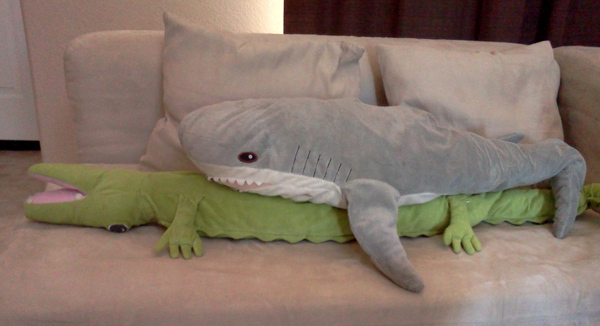 You see, we’ve got these two big stuffed animals from IKEA: a great white shark and a crocodile. They’re too big to stay in the kids’ bedroom all the time, so they usually lay down on one of the living room sofas, minding their own business. Well, that was until I saw this taking place on the couch. Ouch! What is going on here? Sorry for the graphic image, I warned you this post wasn’t for the squeamish. 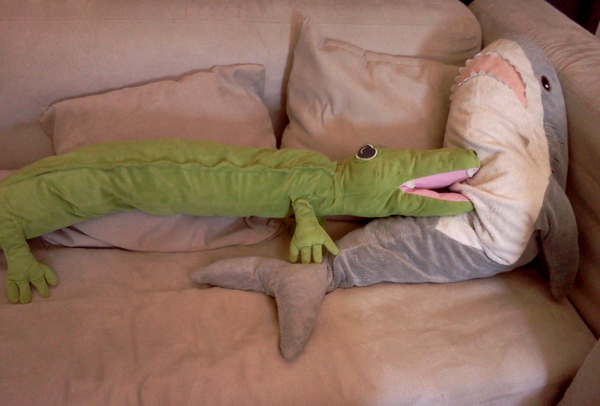 I guess if a shark and a croc were left to fend for themselves in the water, this may happen. Two great predators who clearly don’t get along. I somehow feel relieved they don’t share the same waters in real life. A few days later, I captured this scene late one night. Wow, that croc is getting sneaky! Now that really must hurt. 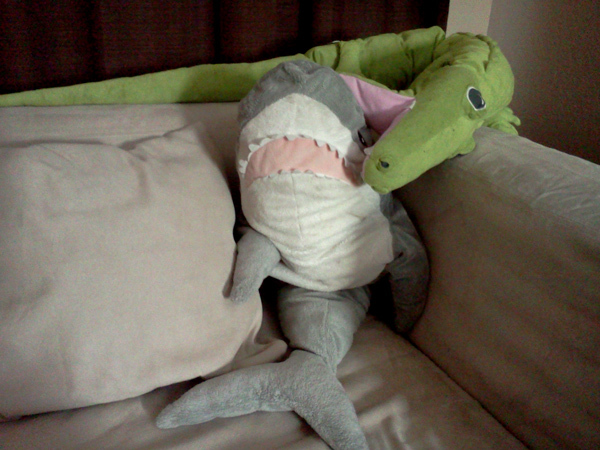 I guess the shark finally got enough because this is how I found those two fighters this weekend. Did the shark finally get his revenge? Or is something completely different happening here? Hmm, I’m not sure what to think. How do you think this will all end? Or is this just the beginning? 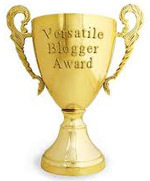 Today I’m participating in the WordPress weekly photo challenge and this week’s theme is “the hue of you”. The people at WordPress are asking us to share a hue that represents us, who we are as a person, or how we’re feeling at the moment. 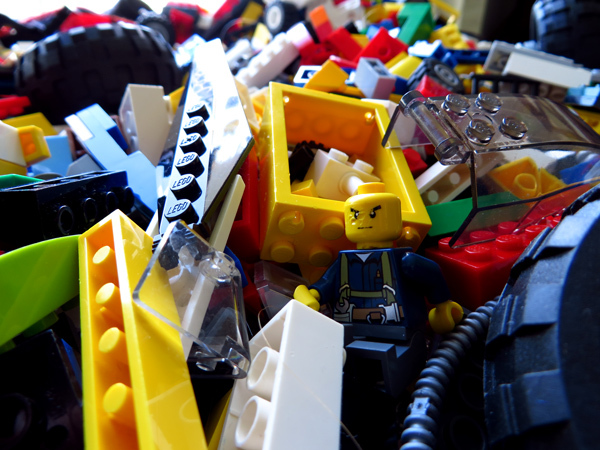 First let me share my boys’ hue, or rather hues, coming from our giant bag of Lego bricks and other shapes. Even their clothes have the same hues. Well, maybe except for yellow, because who looks good in bright yellow, apart from the Lego guys? Do you see any feminine colors in there? No? I didn’t think so. That’s because, as my boys like to remind me on a regular basis, “pink is for girls”. Pink and purple (and blue) happen to be my favorite colors and represent the hue of me much better than the bright yellow Lego colors. 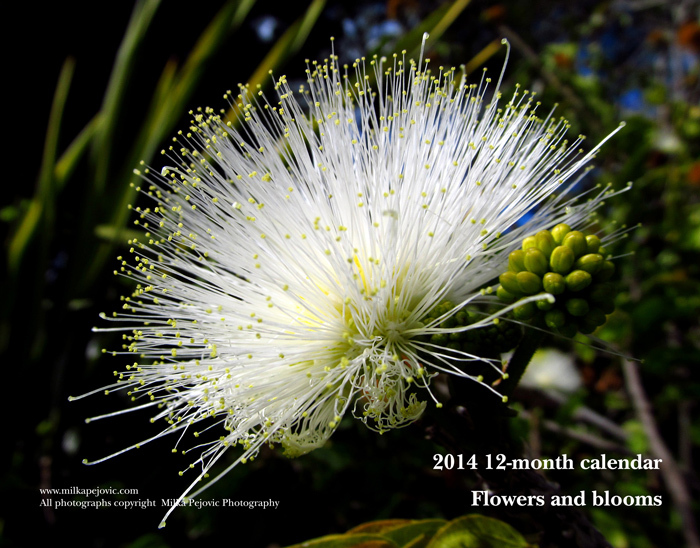 To see my favorite colors, hop on over to my photography website for a different version of this challenge.